If you want to increase your writing productivity From Idea to Final Draft: How to Increase Your Writing Productivity From Idea to Final Draft: How to Increase Your Writing Productivity You don't have to be Stephen King to be a productive writer. Using the right applications and writing tips, you can get more writing done with less frustration, and finish what you start. Read More on your Mac, one sure fire way to do so is to use full-screen mode in a distraction-free text editor program. Open webpages, scattered Finder windows and the bells and whistles found in many applications can distract us from getting writing done. The following short video compares four Mac writing applications that include useful features for writing in full-screen, or what is known as “composition-only” mode. Not only is entering full-screen quicker than having to close all other distractions, it’s also an excellent feature for helping you focus on writing. The video above covers four applications, each previously reviewed in MakeUseOf. They include the popular text editor and project management application Scrivener, the Markdown-supported writing environment Ulysses 3.0 Ulysses III: A Clean Stylish Text Editor for Writing and Managing Documents Ulysses III: A Clean Stylish Text Editor for Writing and Managing Documents When it comes to writing on a Mac you're no longer limited to Microsoft Word or Apple Pages. Programs like Ulysses III make writing more manageable, providing only the most essential tools you need. Read More , Apple’s word processor, Pages Pages 5.0 for Mac Includes Smart Inspector Panel, But Less Features Pages 5.0 for Mac Includes Smart Inspector Panel, But Less Features There are plenty of lightweight and easy-to-use text editors for Mac users, but for projects requiring desktop publishing features, Apple's recently overhauled Pages is still a good solution. Read More , and the minimalist text editor Byword Byword Offers Fullscreen Distraction-Free Writing Pleasure On Your Mac Byword Offers Fullscreen Distraction-Free Writing Pleasure On Your Mac Taking your pen to hand - or more often keyboard, in these times - is not always a simple undertaking. That's not to say writing is bothersome. No, rather the opposite. Writing is wonderful, awesome,... Read More . I have compared each of their full-screen, distraction-free modes in action to give you an idea which one fits in with your writing workflow. 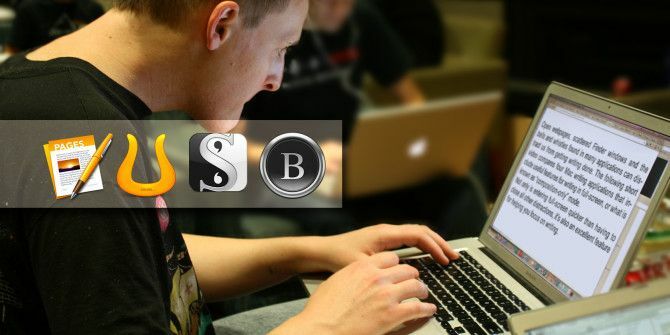 Each of these programs has its unique features, but only Scrivener and Byword allow you to open and view other applications while in full-screen mode. Pages and Ulysses on the other hand open full-screen mode in a separate Spaces desktop, and as a result don’t allow other applications to share that space. These applications don’t prohibit the viewing of other programs on a second screen, should you have one. Let us know what you think of these applications, how you use full-screen mode, and what other features in this area would be helpful to you as a writer. Do you use distraction-free full-screen writing techniques? How else do you get work done? Download: Scrivener ($45.00), Ulysses 3 ($44.99), Pages ($19.99), Byword ($9.99). Explore more about: Blogging, Writing Tips. Have been using the 'BEAN' app and has NO 'bells and whistles, very basic, yet functional on my Mac. Bud, I’ve heard of BEAN, but have never tried it. Thanks for pointing it out. Excellent choices of apps @Bakari, but I would also add Write (writeapp.net/mac/) which has an amazing UI with features such as keyboard swipe selection, Markdown preview, exporting in PDF format, email as HTML, send as SMS and so much more. You should take a look at the Mac, iPhones and iPads versions. We also covered it for the French community of Mac users. OGenius, thanks for your feedback. I don't think I’ve had a chance to check out the Writeapp, so thanks for letting us know about it. I'm curious: why did you leave out Word? I didn't intentionally leave out Word. I rarely use Word for writing purposes, and thus totally overlooked it. I use Word only when clients and other users need me to edit and send documents using the app. Now you have me curious about Word's composer-only feature. I'll check it out. I also quite like the Hemingway app $5 on Mac or win, nor as full featured but has markdown support, distraction free writing mode and helps a little with making your content more readable. Daniel, thanks for the feedback. I'll look into Hemingway.